This post is sponsored by Pet Grass® and the BlogPaws Influencer Network. I am being compensated for helping create awareness about the launch of Whisker Greens™ but A Tonk's Tail only shares information we feel is relevant to our readers. Pet Grass is not responsible for the content of this article. So it's been a few weeks, and the weather outside has been truly frightful, on and off. During the Thanksgiving holiday, we had two days of freezing rain - which made for lovely icicles all over the trees and frozen leaves everywhere. And it ensured Allie wasn't getting anywhere near any sparse bits of grass that might be clinging tenaciously to life. Good thing we had our very own oasis with lush Whisker Greens™ from Pet Grass® for the cats to enjoy. So why does the above remind me of the old "watercooler at work" scene? Do you think anycat was standing around trading juicy bits of Monday morning gossip, or chatting about the last episode of Mad Men after the humans leave for work? As you can tell from the video, our Pet Grass is getting a bit shaggy. Soon it'll begin to turn golden and be ready to reorder. Being from the Heartland where wheatgrass is grown in the fields as crops, we recognize the life-cycle of these plants: these things can grow to 18 inches tall if planted, fed and watered. But what kitty wants to nom on mature grass that's about to turn into a tall, golden wheat stalk anyways? It's those tender juicy baby plants that are soooo delicious. Whisker Greens provides a way you can keep your kitties in yummy green goodness year-round. Faraday guards his Pet Grass from all comers. Like Allie. 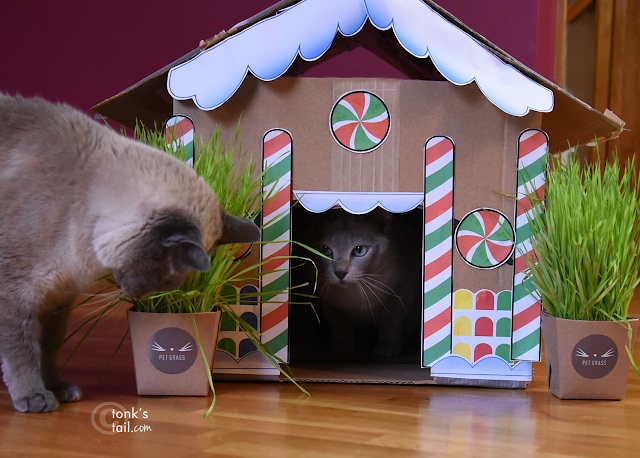 And since it's the holidays, we thought we'd treat you to a festive way you can display your pet grass: as ornamental bushes in front of your very own DIY Gingerbread House. All you need is a nice, big cardboard box, a box knife, and some sturdy tape. For decor, we have some candies, snow trim and gingerbread men you can download and print (links at the end of this post). Just adhere them to your house with a bit of white glue and you're ready to enjoy! If you want to add a bit of green in your kitty's diet, you can buy a Whisker Greens 3 Pack for $24.99. And Pet Grass is offering A Tonk's Tail readers a 10% discount on a one-time purchase. Just use promo code tonk10 at checkout. 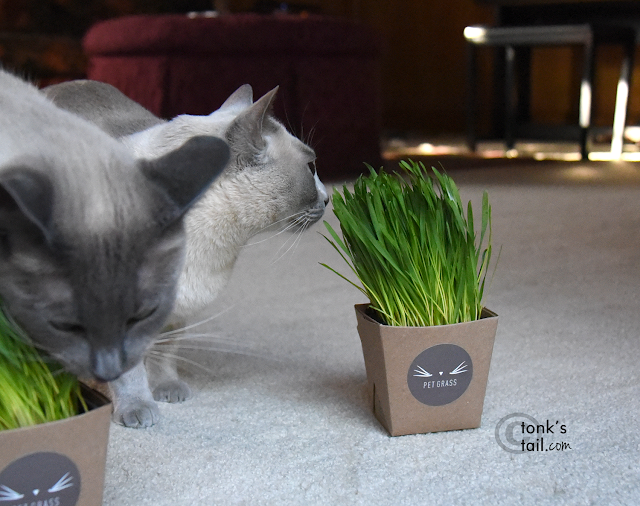 If your cat digs in like ours have and you want to keep them in healthy greens all winter long, you can join the Pet Grass subscription service for $22.49 per delivery. You decide when the product ships – weekly, every two weeks, every 3 weeks or once per month. Maxwell: "Don't mind if I do." Faraday: Are you vandalizing my house, Maxie? Where's the Homeowner's Association Police when you need them? That is SOOOO clever!!! We absolutely LOVE your gingerbread house! ...and the shrubbery! Very nice curb appeal. OMC how amazing is that gingerbread house??? Mudpie and I BOTH want to live there!!! I love your DIY gingerbread house! It looks fantastic!! WE love it! Your gingerbread house is adorable. What a wonderful way to demonstrate the cat grass. I haven't even put together Truffle and Brulee's house! If that don't beat all! You have your own house with your own lawn. Neat! How much rent do you charge. I may want to move in as long as the landlords mow the grass. What a fantastic DIY project! We love your landscaping, too. Max, you did an excellent job helping demonstrate the making of the gingerbread house. I see Allie managed a cameo at the very end. We have tried that stuff a couple times and it IS good. But TBT says that since we go outside briefly every day, he would rather we ate the Nip or grass outside and throw it up there. That grass looks pretty nommy. And that gingerbread house is da bomb! How cute! We love the Pet Grass next to the fountain - very Zen! What a fun project! I just want to say, our grass never got that shaggy because some kitties kept mowing them down. What a totally clever gingerbread house...thank you for all the "parts" to make it happen! Also, we think that the touches of greenery are perfect - nothing like fresh tender green stuff to make the holidays purrrrfect! they are living the life, aren't they. This dog mom is beyond impressed - what a fab DIY!